SAS history teacher Geoffrey Smith was awarded the 2016 Belz-Lipman Holocaust Educator Award sponsored by the Tennessee Holocaust Commission. The award, established by Memphis entrepreneurs and philanthropists Jack A. Belz and Ira Lipman, recognizes outstanding educators who excel in the teaching of the Holocaust. In addition to teaching World History I at SAS, Smith is currently teaching the history elective Night Will Fall: Advanced Topics in Holocaust and Genocide Studies. Taking a cue from the documentary film by André Singer, Night Will Fall, the course examines political and moral lessons from the tragedies of the Shoah and the mass killings in Armenia, the Balkans, Rwanda, and Darfur. Smith believes that asking today's students to grapple with the unsettling events of the Holocaust has implications for the future of American foreign policy, science, medicine, interfaith dialogue, and other contemporary political, social and ethical concerns. 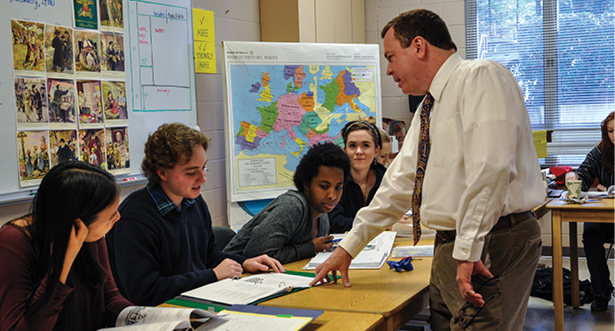 He measures the success of his teaching through the decisions his students make in confronting acts of prejudice, intolerance, and discrimination. He will receive a $1,500 scholarship, which can be used to develop new curriculum, purchase resources, and attend trainings that will help further engage their students in the study of the Holocaust. Smith, a graduate of the University of the South with a B.A. in history, joined the SAS faculty as history teacher in 2014. He was formerly at All Saints' Academy in Winter Haven, Florida where he was chair of the History Department.